Shop online for 25 panzer-tracts at discounts up to 25%. 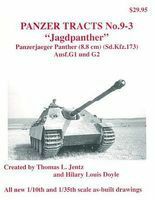 This is the Panzer Tracts No.9-3 Jagdpanther Panzerjaeger Panther Ausf G1/2 Military History Book by Panzer Tracts. 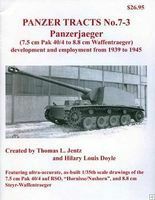 This is the Panzer Tracts No.7-3 Panzerjaeger 7.5cm Pak 40/4 to 8.8cm Waffentraeger Military History Book by Panzer Tracts. 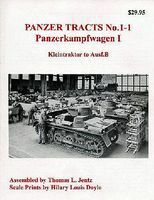 This is the Panzer Tracts No.1-1 PzKpfw I Kleintraktor to Ausf.B Military History Book by Panzer Tracts. 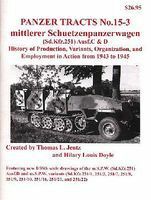 This is the Panzer Tracts No.15-3 Mittlere SchuetzenPzWg (SdKfz 251) 1943 to 1945 Military History Book by Panzer Tracts. 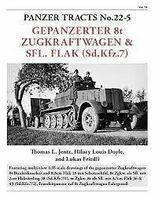 This is the Panzer Tracts No.22-5 Gepanzerter 8t Zugkraftwagen & SflFlak (SdKfz 7) Military History Book by Panzer Tracts. 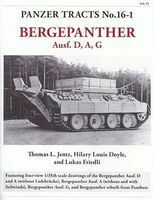 This is the Bertha Big Brother Karl Geraet Super Heavy Self-Propelled Mortar Military History Book by Panzer Tracts. This is the Panzer Tracts No.18 PzKpfw 38(t) Ausf A-G/S Military History Book by Panzer Tracts. This is the Panzer Tracts No.22-1 Leichter Zgkw 1t (SdKfz 10) Ausf A/B Military History Book by Panzer Tracts. This is the Panzer Tracts No.13-2 Schwerer PzSpahWg & PzFuWg (SdKfz 231, 232, 233 & SdKfz 263) Military History Book by Panzer Tracts. This is the Panzer Tracts No.15-1 Leichter SchuetzenPzWg SdKfz 250 Ausf A/B Military History Book by Panzer Tracts. This is the Panzer Tracts No.22-4 mZgkw 8t (SdKfz 7) Military History Book by Panzer Tracts. 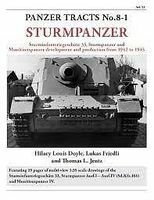 This is the Panzer Tracts No.3-2 PzKpfw III Ausf E/F/G/H Military History Book by Panzer Tracts. This is the Panzer Tracts No.23 Panzer Production 1933-1945 Military History Book by Panzer Tracts. 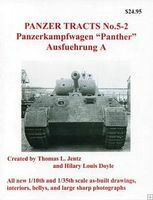 This is the Panzer Tracts No.5-3 PzKpfw Panther Ausf G Military History Book by Panzer Tracts.